Our board-certified cardiologists have undergone years of extensive training to offer the highest quality cardiology and pulmonary care to your pets. During your consultation with our doctors you will be provided a comprehensive explanation of your pet’s diagnosis, treatment care plan and recommendations for follow-up care. Our goal is to ensure that you do not leave our office with any questions unanswered. If you have additional questions or concerns when you arrive home we ask that you contact our office with any issue. Follow-up questions are directed through one of our highly trained cardiology technicians. Our care does not stop at the door. Our cardiologists usually operate with a full appointment schedule daily. However, cardiac emergencies do arise and we will be available to help. If you feel that your pet is in an urgent state, please call our office immediately. We will guide you to the location that is best suited to provide immediate attention to you and your pet. You will be directed to a cardiology technician that can help lead you through what to expect when you arrive. Rest assured that when we evaluate your pet we always administer the necessary urgent care immediately. An echocardiogram is an ultrasound of the heart that allows the cardiologist to evaluate the structure and function of the different chambers of the heart, as well as the large blood vessels that leave the heart. During the echocardiogram your pet may be gently laid on his/her side on a specially made, padded echo table. Alcohol and ultrasound gel are needed to facilitate contact between the echo probe and your pet’s body. After the images are acquired our cardiologist take detailed measurements and generate a report with their diagnosis and recommendations. Our diagnostic capabilities include advanced veterinary echocardiography using Philips ultrasound equipment with color Doppler and spectral Doppler technology.We use the Philips iE33, Philips EPIQ 5 and the portable Philips CX50 ultrasound machines – the newest, most advanced technology available. Note: Most patients do not require sedation or anesthesia for preliminary testing. For patients that are easily stressed, sedation is available and administered with your consent. An electrocardiogram (ECG or EKG) is a recording of the electrical activity of your pet’s heart. It is performed in conjunction with an echocardiogram as dogs and cats with structural heart disease are at higher risk for cardiac arrhythmias, even if an arrhythmia is not heard during a physical exam.To acquire the ECG your pet may be gently laid on his/her side and four atraumatic electrode clips are placed on their limbs. Our Cardiosoft Electrocardiography software is the most sensitive and accurate EKG monitoring system for veterinary use. Accurate blood pressure monitoring can be achieved, in our office with precise measurement using a Doppler system. This system is different than a standard MAP blood pressure assessment using a monitoring machine. Our Doppler machine uses sound waves to measure blood flow acoustically. This give us the exact measurement of systolic blood pressure. Often, our cardiac patients will need regular monitoring of their blood values. This allows us to look at a comprehensive picture of your pet’s health as treatment proceeds. We have the ability to monitor values in the office and will provide you with results. Blood work should be a regular assessment in cardiac patients and we offer this option for convenience. You are welcome to have your blood work performed at your primary care veterinarian but please make sure we receive the results to update our medical records. The main diagnostic our doctors use to assess the lung fields and the heart size are x-rays. X-rays allow us to measure parts of the heart that show heart enlargement, a common effect of heart disease. The x-rays also allow us to evaluate the lung fields. Evaluation of the lung field allows the doctor to determine whether your pet may have a build-up of fluid due to heart failure. 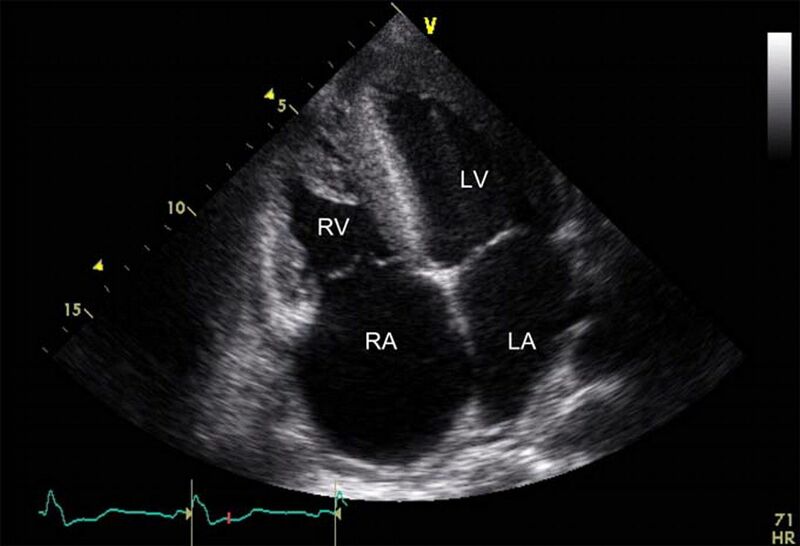 (This cannot be seen on an echocardiogram). The doctor can also asses pulmonary and airway disease from x-rays. Radiographs are often a necessary diagnostic in order to get a complete measurement of the severity of the heart or lung disease. Transtracheal wash is performed when our doctors need to get sterile samples from your pet’s airway in order to obtain a more comprehensive diagnosis of airway disease. 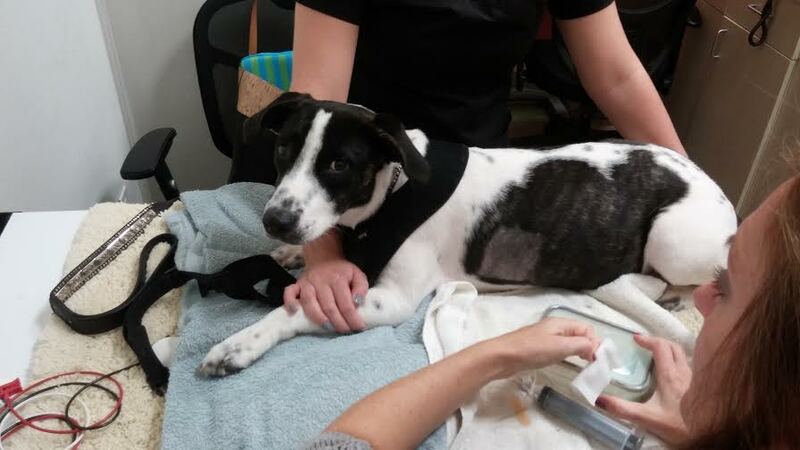 The procedure is fairly quick but does involve general anesthesia so complete examination will be needed to evaluate your pet’s anesthetic risk. These procedures are performed on an out-patient basis and your pet should be able to go home the same day. The sterile samples are sent to a trusted pathologist for evaluation. Bronchoscopy is generally performed after a trans-tracheal wash procedure. We use a Pentax digital video endoscopy system with pediatric endoscopes to perform bronchoscopy, a visual diagnostic evaluation of the trachea and lower airways. We can see, through the use of a tiny camera, very deep down into the upper and lower airways. This diagnostic helps with diagnosis of pulmonary fibrosis, inflammation and tracheal collapse. Fluoroscopy is described as a “moving x-ray”. It is a real time video display of an x-ray image. We utilize fluoroscopy during several different procedures, including transvenous pacemaker implantation and tracheal stent implantation. Fluoroscopy is also used to diagnose tracheal collapse. Pacemaker implantation is advised when a pet has an electrical system disease that causes their heart to beat too slow or skip beats. Pacemaker implantation is a life-saving procedure and a permanent treatment to correct the electrical system. Under general anesthesia, the cardiologist inserts an electrical lead into the heart and implants a generator (or battery) underneath the skin. The procedure is very similar to that in humans. 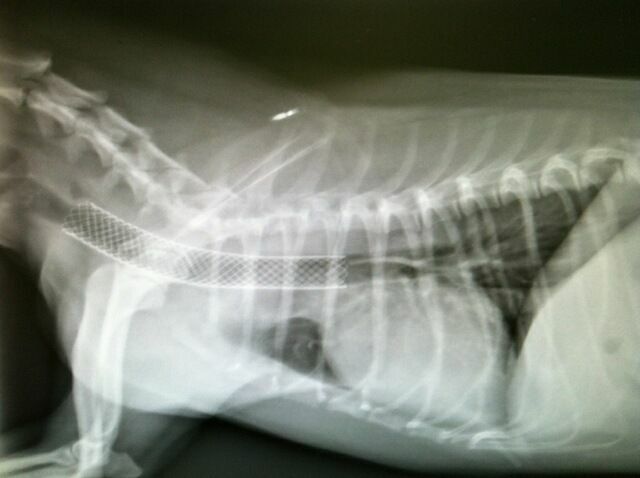 The implant is permanent and the lead will stay in place for the life of the pet. Tracheal stent implantation is advised when a pet has tracheal collapse severe enough to cause difficulty breathing. Some patients have episodes of breathing difficulty, while others have distress all of the time. Stent implantation is a permanent implant in the trachea that allows the collapsed area to be held open for the passage of air.